Harry has been very interested in magic tricks lately. We've seen a couple of little magic shows, and he has been fascinated watching magic trick videos on YouTube. Most magic tricks take a lot of time to practice, which is difficult for little ones, so I researched a few super simple tricks that take little preparation and young children can easily learn to perform themselves. They look really effective too! Draw around the rim of the plastic cup on to some coloured card and cut out the circle. Glue the coloured circle firmly across the top of the glass. Use the remainder of the coloured card as the base for the trick. Explain to your audience that you will be making a coin disappear. Take your coin and place it on the base sheet of coloured cardboard. 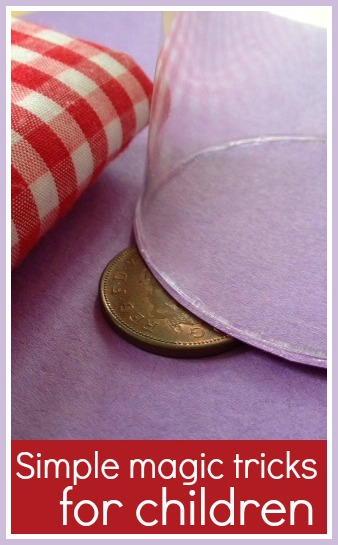 Place the handkerchief over the glass so that it is completely covered, then move the handkerchief covered glass and place it on top of the coin. Remove the handkerchief, and the coin has disappeared! Make sure that you clear away the props for this trick quickly though before your audience spots what is going on, and make sure that the upturned glass always remains on your base sheet of coloured cardboard. Firstly you need to prepare your toilet roll tube. Make a small hole in the back of the tube about halfway down which is large enough to fit your thumb. Then decorate the tube using felt pens, stickers, coloured tape, paint and so on. This final trick is a bit more complicated for little ones, but an adult can pick it up really easily and it's great for impressing the children with. Again, it's one that you need to learn from a video. I taught myself quickly and I've been showing it off ever since! There is a wealth of videos on YouTube with magic tricks for all ages and skills, it's definitely worth having a go at learning some! Wow, that 3 cup one is a revelation. I don't try and "solve" magic tricks (maybe because I like to believe in magic), but it is still nice to see how they are done.